Windows 7 Welcome Screen Updater is free software supported by donations, not advertisements. The Windows 7 Welcome Screen Updater utility is a quick way to customize your computer. 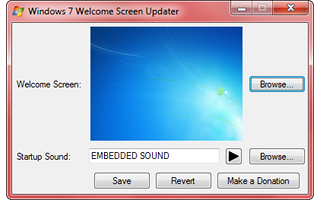 Simply select the JPEG image you want as a Welcome screen, and/or a WAV file for a System Startup sound effect, and Windows 7 Welcome Screen Updater will take care of all the work for you. A backup of the original screen is saved, just in case, and can be restored by pressing the Revert button. Be the first to post a comment about Windows 7 Welcome Screen Updater!